The final 10 players in our countdown presented some of the NBA's most difficult player debates: Russ or Harden? Kawhi or Curry? And most important of all: LeBron or KD? Our answers below. 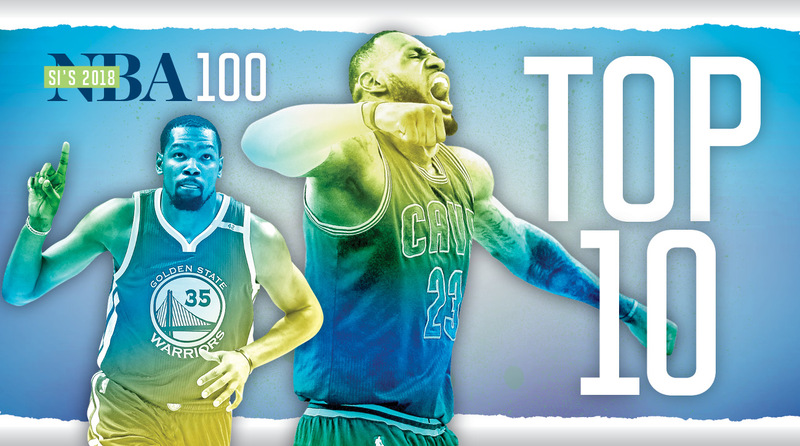 The Crossover is proud to offer our list of the Top 100 NBA players of 2018, an exhaustive exercise that seeks to define who will be the league's best players in the 2017-18 season. Given the wide variety of candidates involved and the deep analytical resources available, no single, definitive criterion was used to form this list. Instead, rankings were assigned based on a fluid combination of subjective assessment and objective data. This list is an attempt to evaluate each player in a vacuum, independent of their current team context as much as possible. A player's prospects beyond the 2017-18 season did not play a part in the ranking process. Injuries and injury risks are an inevitable component of this judgment. Past performance (postseason included) weighed heavily in our assessment, with a skew toward the recent. First-year players were not included. A predictive element also came into play with the anticipated improvement of certain younger players, as well as the possible decline of aging veterans. Salary was not taken into consideration. Otherwise, players were ordered based on their complete games. You can read more here on the limitations of this kind of ranking. To see our 25 biggest snubs from this year, click here. Please feel free to take a look back to SI.com’s Top 100 Players of 2017, 2016, 2015, 2014. A special thanks, as always, to those resources that make researching a list like this possible: Basketball-Reference, NBA.com, ESPN.com, Nylon Calculus, and Synergy Sports. If Green (10.2 PPG, 7.9 RPG, 7.0 APG) comes off as arrogant, it’s only because he knows exactly how good he is. He’s seen entire possessions smothered by his coverage alone, bouncing from one threat to the next as if they weren’t half the court apart. He’s experienced the Warriors’ offense at its highest gear, which so often relies on his playmaking as its beating heart. He also watched as Golden State lost its edge in Game 5 of the the 2016 Finals without him. That a suspended Green put himself in that predicament with a nut-kicking spree is an unfortunate part of the experience. In the end, his absence affirmed—somewhat cruelly—his value to one of the greatest teams in NBA history. Green has since redeemed himself as best he can, reinforcing his case as the ultimate team player—in game, if not always in affect. One can count on a periodic explosion from Green when he sees something he doesn’t like. One can also expect a steady flow of winning plays from one of the league’s great gamers. There are battles within battles within battles for Green, who is never short a chip on his shoulder. The results are unimpeachable: singular defense, smart facilitation, and a selfless commitment to cause. So many players in recent years have grumbled when asked to shift up a position and guard bigger, stronger opponents. Green seems to relish it. Never is Draymond more in his element than when battling a seven-footer and daring them to step out to the perimeter. It would be nice if Green finished slightly better around the rim. Otherwise, he is exactly the player he needs to be to catalyze the team game around him. The way Green reads the floor on the move makes it almost useless to trap his point guard (as is so tempting with Stephen Curry). His passing is good for approximately 18 points a night between twos, threes, and free throws, a handful coming through assists at incredible angles. His shooting—while touch and go—offers just enough tug on the defense to keep things moving at all times. And most important of all: Green plays an all-encompassing brand of defense that allows any lesser defenders around him to play to their strengths. Remember: the most unsolvable defense in the NBA is a high-wire act built on Green’s situational awareness. It’s important that Green is so strong and so mobile. But what makes him functionally irreplaceable—so much so that voters crowned Green the Defensive Player of the Year—is the way he executes. When it comes to the judgment calls that determine success and failure on every defensive possession, Green is a prodigy. Even more valuable than his ability to switch out to the perimeter is that he knows exactly when he needs to. The biggest question about Antetokounmpo (22.9 PPG, 8.8 RPG, 5.4 APG) went from “Is he for real?” to “Who can stop him?” in 12 months flat. The reigning Most Improved Player enjoyed an uber-breakthrough in 2016-17, setting new career-highs in basically every meaningful category: points, rebounds, assists, steals, blocks, FG%, Usage, PER, Win Shares, True Shooting Percentage, and a partridge in a pear tree. Even without a reliable three-point shot or all that much help around him in Milwaukee, Antetokounmpo evolved into a consistently unguardable phenomenon, deploying his otherworldly length, open-court creativity and improved ball-handling to maximum effect. Over the years, writers have concocted Narnia, Wonka’s Chocolate Factory, and the land of Oz, but fiction hasn’t produced anything quite as magical as Antetokounmpo striding from mid-court with only one defender between him and the basket. Thanks to his do-everything, attack-minded offense and seamless ability to switch between numerous defensive positional assignments, there was little doubt that Antetokounmpo, an All-NBA Second Team and All-Defensive Second Team selection, was the best all-around player during the Bucks’ first-round series loss to the Raptors. However, his ranking here reflects an expectation of even more to come. Kobe Bryant himself recently challenged the 22-year-old Antetokounmpo to win 2018 MVP, a lofty goal indeed, but there are other important, and achievable, boxes waiting to be checked. To solidify his standing among the NBA’s top 10 talents, Antetokounmpo must develop a league-average three-point stroke, improve his comfort and decision-making in the pick-and-roll, lead Milwaukee to a top-10 offense, compete for home-court advantage in the East and, of course, win a playoff series for the first time in his career. Davis, considering the particulars of his game and his team in New Orleans, is really making the most of things. What was rarely a well-spaced offense last season still gave ground for Davis to put up 28 points per game on 58% True Shooting—a strong figure considering the volume involved. The closest Davis (28 PPG, 11.8 RPG, 2.1) comes to easy baskets these days are those he essentially creates for himself. There are ways for a 6’10’’ player who moves like a gazelle to get open. The shame of it is that Davis has to work as hard as he does to find those openings, much less slide anywhere near the hoop with the ball in hand. The interplay of shooting and mobility gets Davis by. Pelicans coach Alvin Gentry, to his credit, pushes on the edges of Davis’s game. Some of New Orleans’s sets feature Davis curling around screens and up the wing like a guard, mimicking a route that C.J. McCollum might take. Plenty of bigs in the NBA can knock down an 18-foot jumper. Davis can do it while sprinting away from his defender, planting his feet correctly on the catch, and quickly squaring his body toward the rim. (It’s worth noting that Davis is a better shooter than Antetokounmpo—a natural comparison given their close ranking—at every range.) If this seems like a needless diversion for one of the best finishers in the league, it’s not. Unlocking Davis’s full potential as a shooter is the kind of development that could forever change how opponents guard him. That’s saying something, considering that defenses barely know what to do with Davis as it is. His face-up game is nasty; a quick first step allows Davis to create momentum toward the rim even in close quarters, a gift that plays well off of the looming potential of his shot over top. As such, defenders wind up crashing into Davis all the time (8.6 FTA per game). They reach and they lunge because what else are they to do? The more Davis moves, the deeper the trouble for the big asked to contain him. Imagine what could be in store when there’s actually enough shooting around Davis to punish the crowding defenders who have become a part of his everyday life. Davis and Antetokounmpo are knocking on the door here, but Paul deserves the benefit of the doubt. Few are more trustworthy when it comes to the combination of talent, drive, and control. Competitors this vicious too often lose sight of their team’s needs in the heat of individual matchups. Playmakers this gifted typically come with some other glaring flaw or passive streak. Not so with Paul, who can be counted on to play hard and intelligently every night with one of the point guard position’s most complete skill sets. An offense could hardly be in better hands. Paul is the sort of basketball thinker who can keep tabs on the game’s many layers at once: what’s working and what isn’t, why that’s the case, and how the outcome is influencing the players around him. He seems to know just when a teammate needs a touch and just when an opponent is starting to lose focus. His is a mind at work. There’s always some calculation running in the background with Paul, and the result is an attack run alarmingly close to technical perfection. Thinking the game like Paul does opens it up to angles of attack most players are blind to. Sometimes, that can create friction between Paul and his teammates. Experiencing the game on that level has made Paul a domineering force—micromanagerial at a level that can grow tiresome. It’s not that Paul is wrong when he raises these issues, merely that he does so pointedly. Sometimes his objections come in the form of a running commentary. In other cases, he will literally jump up and down in annoyance. Every teammate deals with this kind of feedback differently. It’s easier to stomach, though, after seeing all that Paul can do. Shooters will have career years because of Paul’s dedication to placement. It’s not enough that a ball ends up in the right hands—those hands have to actually make the catch in the right rhythm. In the same vein, Paul doesn’t look to assist cutters so much as lead them. He functions on a wavelength where he is passing his teammates open, actively creating shots that aren’t otherwise there. Paul has a way of finding those seams. When he isn’t threading passes along them, he’s slithering with a live dribble. There’s only so much that can be done when a player of Paul’s vision is also one of the NBA’s best pull-up jump shooters. Every ball fake could be the real deal—thus demanding a defensive response—or merely a setup to get into the next move. Paul may also have the best hands in basketball. They make him a bigger defender than his 6’0’’ frame would suggest, because every dribble an opponent takes becomes something that Paul can challenge. Drives against him expose the ball. Post-ups leave a crucial vulnerability—along with the opportunity for Paul to draw a charge. Nine times Paul has made an All-Defensive team (including the first team in 2016-17) because he knows where to be and what risks to take. That—fueled by Paul’s will and enacted by those remarkable hands—makes for quite the obstacle. How does the reigning MVP—the only player to average a triple-double since 1962—miss out on a top-five ranking? By the thinnest of margins. Even for those who anticipated a big response to Kevin Durant’s departure, Westbrook (31.6 PPG, 10.7 RPG, 10.4 APG) shattered all expectations during a sensational 2016-17 season. He led the league in scoring, set an NBA record for usage rate, took his one-man army approach to even greater heights in clutch situations, and carried Oklahoma City to 47 wins. His personality, energy, conviction, indefatigability, durability and relentless playmaking made the Thunder a playoff team and must-see television. Without him, Oklahoma City was bad, boring, and sad, posting a -8.9 net rating when he went to the bench, a mark that was worse than every team in the league. Westbrook was the hope, the team, and the franchise. But a humbling first-round playoff series loss to the Rockets confirmed that there was a hard ceiling to The Westbrook Show, that over-relying on one player to such an insane degree was both unhealthy and counterproductive. Westbrook’s response to the postseason stakes and his mediocre supporting cast was to double down and then triple down, posting insane stat lines and ugly shooting efficiency numbers in hopes of overcoming his opponents through sheer will. 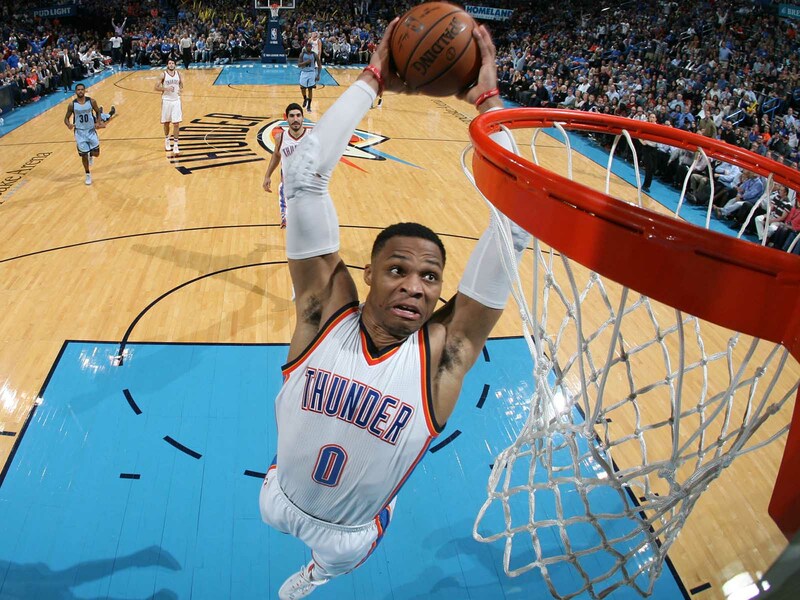 At its highest level, modern basketball is a lot more sophisticated than Westbrook’s preferred Martyr-Ball, and the Thunder proved to be a surprisingly easy out. Like Russell Westbrook, Harden (29.1 PPG, 8.1 RPG, 11.2 APG) posted a historic stat line in 2016-17 not seen since Oscar Robertson. Like Westbrook, Harden enjoyed great health and durability while maintaining a career-high usage rate so inflated that it often looked like a misprint. Like Westbrook, Harden turned in multiple 50-point games and caused his team’s offensive efficiency rating to spike up by more than seven points when he took the court. Like Westbrook, Harden lifted his team into the playoffs without the help of an All-Star co-pilot. Like Westbrook, Harden’s dream season crumbled in the postseason. With so many parallels, why should Harden, the 2017 MVP runner-up, get the nod over the Westbrook on this list? For starters, Houston’s offense under Harden was much, much more efficient than Oklahoma City’s under Westbrook. While one could argue that Harden had more help, his superior passing ability and pick-and-roll mastery ensured that Houston maximized the value of its supporting members, from lob target Clint Capela to spot shooters like Ryan Anderson and Trevor Ariza. The Rockets were more explosive, more consistent, and more cutting-edge than the Thunder, posting the No. 2 offense in 2017 and a top-10 offense of the three-point era. Harden’s approach to offense is more transferrable and sustainable because it so thoroughly masters basketball’s best practices by generating high-percentage looks at the rim, at the free-throw line, and at the arc. While his cheeky foul-drawing ability is well-known, Harden (68.2%) shot significantly better than Westbrook (57.6%) on shots within three feet from the hoop, and he’s been a far more reliable three-point shooter over the course of their respective careers. Harden is wired as a score-first guard and he commits his fair share of turnovers in traffic, but he doesn’t suffer from tunnel vision to the same degree as Westbrook, and he boasts a crisper handle, better vision, and more size on the ball. Last season, Harden also led the NBA in points generated by his assists thanks in part to his knack for creating open threes for his teammates, often by whizzing LeBron-like crosscourt passes. No debate in our ranking process was more agonizing than Kawhi Leonard vs. Stephen Curry. In one corner, you have the league’s most impactful offensive player. In the other, you have its most balanced—an all-time defender who just so happens to produce like a superstar. The points of separation are largely matters of taste. We gave Curry the edge (see below for our explanation), but there are many cases in which Leonard, who plays such a universal game, would present a greater value. There is no better individual defender in the league. When Leonard sinks his teeth into a matchup, he forces his opponents out of their best options. That’s enough to push some offenses to the edge; not every team is equipped to load ball handling and usage on its second- and third-best players, and yet to go right at Leonard is a roadmap to a dead end. He’s so plugged in to how players think and how offenses run that even throwing a pass in his general direction presents a huge risk. Teams can try to pull the man Leonard is guarding away from the action as much as possible, but even then he demands constant supervision. It’s rare for a wing player to foist such far-reaching control on that end of the floor. Some of what sets Leonard apart is just how little his coverage slips between various positions. Leonard seems just as comfortable locking up a wing shooter as he does smothering a point guard or standing ground against a big. Almost any matchup will do, which gives the Spurs tremendous flexibility in drawing their plan of attack. Once assigned, Leonard will also edge his way into plays beyond the defensive range of even high-level defenders. His sphere of influence is just slightly larger, making Leonard uniquely unpredictable. There is, however, some degree of diminishing returns involved when a primary creator is also a first-choice defender. Leonard shouldn’t be penalized for his all-around game, but we have seen it take a toll on him in a postseason setting. Usage—on both sides of the floor—has its practical limits. What distinguishes Leonard is less the idea that he should bear so much responsibility at all times than the fact that he could contribute as needed from moment to moment. There's no player in the league that has power quite like Steph Curry. It’s because of him that a certain breed of big man has become almost completely obsolete. If a power forward or center can’t hang 20 feet from the basket, he can be played off the floor. It’s because of Curry that switchable wings have become a functional necessity in the league, because there is no hope of beating his Warriors without them. Curry leaves nowhere to hide. Try to stash away a poor defender on one of Curry’s teammates and he’ll fish them out by running around staggered screens or pulling them in to defend a pick-and-roll. It takes an entire team of perfectly cast defenders to have any hope of denying Curry. Even then, the best-conceived strategies employed by well-suited opponents are left to the mercy of his long-range artillery. Teams will spend months fine-tuning their strategies and rotation only to have Curry dictate—in no uncertain terms who can play and who cannot. To operate against his team is to throw out the book. Containing Curry requires such specialized coverage that even those who do it well are forced to abandon the delicate chemistry of their existing systems. The gravity that Curry imposes on a defense is well-documented (Remember this? ), but its implosive effects run even deeper than many realize. Most every Warrior sees his True Shooting Percentage skyrocket when Curry is on the floor, improving anywhere from eight to 20 (!!) percentage points. How could an opposing team hope to meet that sort of influence? It’s so hard to consistently take away what Curry does well that most teams are doomed before they even try. Often, the best option available is to hope that Curry whips a few careless passes and whiffs on a few shots he usually makes. Still he has to be closely guarded for fear of what terrors he might unleash if he’s not. This is what makes Curry the best “off-night” player in the league. He can go 3-for-14 from the field and finish the game with a +20. He can go 6-of-19 and wind up +25. He can shoot 7-of-20 against the defending champion Cavs and go +23 in a blowout. So harmonious is Curry’s game that it can scale down from the highs of back-to-back MVPs to make room for Kevin Durant, all while leading the league in plus-minus. Golden State outscored its opponents by 1,015 points last season with Curry on the floor. The player with the next best plus-minus (Draymond Green) came in at +820. If the circumstances required Curry to do more, he’s shown that he could put up even crazier numbers behind league-wrecking efficiency. 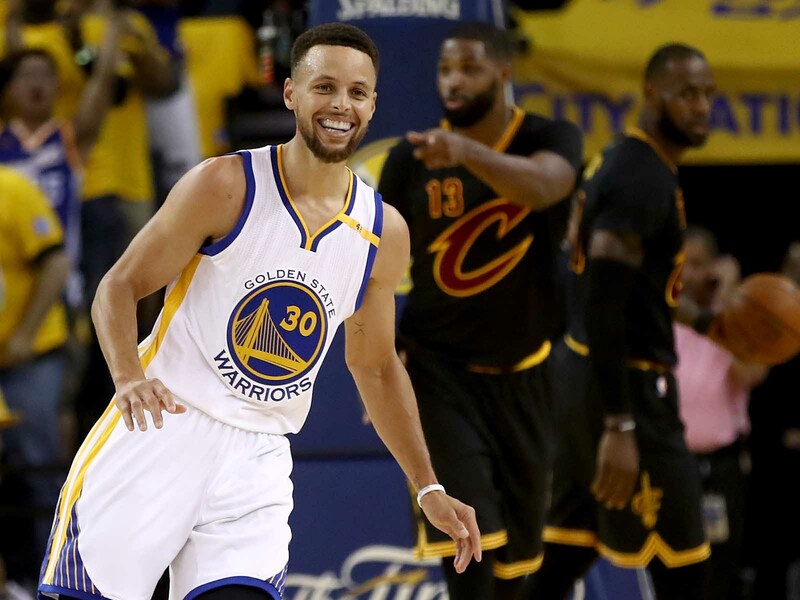 There is a faulty impression—its flame fanned by the 2016 Finals—that Curry’s success is somehow phony. Some see the spectacle of his long-range game and miss the fact that Curry has become a tremendous, creative finisher (62.8% FG in the restricted area) who springs open driving lanes. They see a finely tuned offense built around him (one that Curry’s shooting makes possible) and conveniently neglect that Curry was also one of the NBA’s best isolation scorers last season—more efficient in one-on-one situations than Durant, Leonard, LeBron James, Russell Westbrook, and James Harden. Even Curry’s defense is misunderstood; some opponents will always get the better of him, physically, but Curry can add to a sound system through his steals and timing. The mismatch situations that gave a hobbled Curry trouble in 2016 have been mitigated by his improved ability to swipe-and-recover or compete after switching. 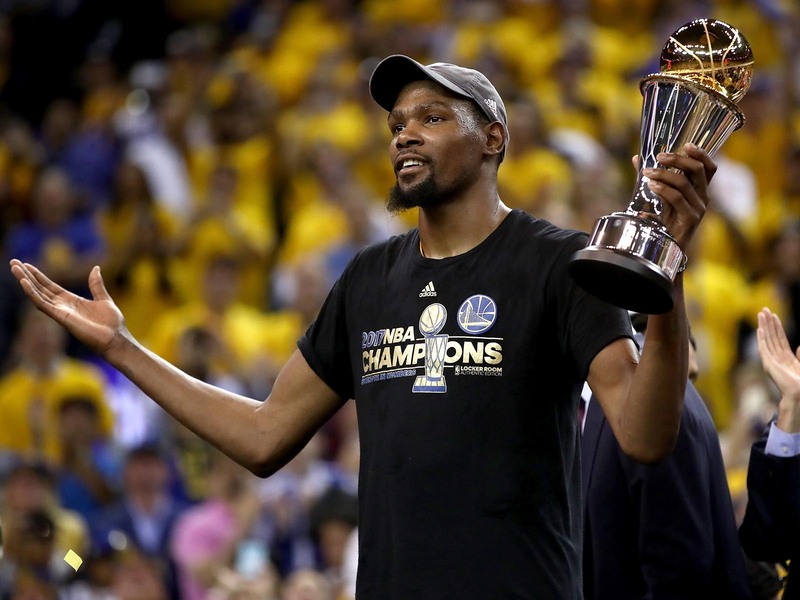 When the cold-blooded Durant (25.1 PPG, 8.3 RPG, 4.8 APG) lined up a deep three over LeBron James and then splashed the biggest shot of his career late in Game 3 of the Finals, he ended the long-standing narrative that he couldn’t beat the King and all-but-cinched the first NBA title of his 10-year career. With that shot, and a spectacular overall showing against Cleveland, Durant validated his polarizing decision to leave Oklahoma City for Golden State, completed his comeback from a scary late-season knee injury, stated an unimpeachable Finals MVP case, and took the Warriors another step closer to becoming a full-fledged dynasty. But he didn’t knock James off his throne. Indeed, Durant, 28, lived his best basketball life with the Warriors last year, finishing second in the NBA in PER and setting a new career-high for True Shooting Percentage thanks to a pass-heavy, movement-heavy, high-speed, No. 1 ranked offense that hand-delivered a steady stream of dunks, open threes and exploitable one-on-one match-ups. Asked to shift up a position in Golden State’s small-ball lineups, Durant also set new career-high for rebounds and blocks and was tracking towards All-Defensive team consideration prior to his knee injury. In the aftermath of Golden State’s title, coach Steve Kerr told ESPN’s Zach Lowe that Durant was a superior player to Curry, pointing to his length, size and positional versatility. SI’s Top 100 of 2017 reached the same conclusion for similar reasons and sees no reason to change course for 2018. While Curry is the best shooter in the history of the game with undeniable, game-altering gravity, Durant is arguably the league’s top one-on-one scorer, an excellent shooter himself, and a willing and intelligent passer with plenty of experience reading defenses. But that’s only the beginning: Durant is also capable of being a plus defender at both the three and the four, he possesses the mobility and length to step out on smaller players in switching scenarios, and he can protect the rim well enough to shift up to the five in super-small looks. He can deliver quality defensive minutes at playoff-level intensity against premier wings like James and Kawhi Leonard, something that Curry, James Harden, Russell Westbrook and other A-list guards cannot. In a vacuum, Curry’s presence virtually guarantees an elite offense, and his ability to attract extra defensive attention helps average players reach their full potential. However, Durant offers a better chance at both an elite offense and an elite defense, making it easier to build a contender from a random cast of teammates. He can throttle his offense and usage up or down as needed depending on his supporting pieces, and he can fill or help to fill virtually any positional role in a team’s frontcourt. The 8-time All-Star and 7-time All-NBA selection creates mismatches on one end and eliminates them on the other. Had James been less exquisite during the Finals, the door might have opened for Durant to claim the top spot on this year’s list. But Cleveland’s four-time MVP somehow averaged a 33-point triple-double against a far superior Golden State team loaded with quality primary and secondary defensive options geared to stop him. 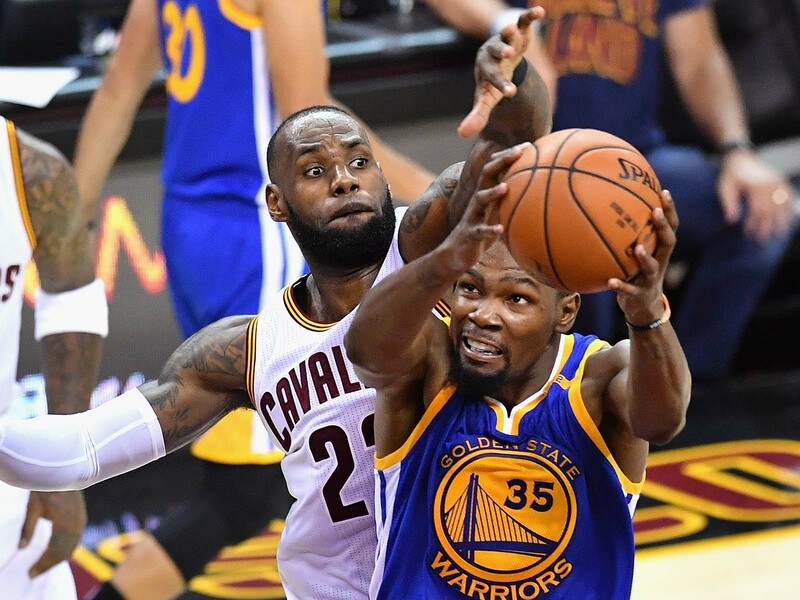 If the two superstars had switched teams for the series, Durant wouldn’t have been able to replace James’s passing, playmaking and decision-making for the Cavaliers. In that hypothetical star-swap scenario, Golden State likely sweeps Cleveland, as the Warriors’ depth and talent advantages would have ultimately overwhelmed Durant. He would surely have found himself stuck without enough help to counter James. Slowly but surely, some minor cracks have developed in James’s seemingly impenetrable reputation as the NBA’s best player. He hasn’t won MVP honors or led the league in PER or Win Shares since 2013. He hasn’t earned an All-Defensive selection since 2014. He hasn’t captained the league’s top offense or played for the league’s winningest team since 2013. He “only” finished fourth in 2017 MVP voting, second in the league’s most recent ranking of jersey sales, and third in 2016 All-Star fan votes. But James (26.4 PPG, 8.6 RPG, 8.7 APG) maintains the No. 1 spot on this list for the fifth straight year because he continues to consistently reach heights that no other current player—and virtually no other player from any era—can touch. Even after 14 seasons and 12 playoff runs, his peak play tops any of his contemporaries’ peaks, and he’s proven in each of the past three years that he can sustain that transcendent level of dominance throughout an entire postseason run and against superior opponents whose game plans are specifically geared toward exhausting him. The only player in NBA history to match James’s 2017 postseason stats—32.8 PPG, 9.1 RPG, 7.8 APG—across multiple playoff rounds was James himself in 2009. The only player in NBA Finals history to match James’s triple-double stats against Golden State—33.6 PPG, 12 RPG, 10 APG—was no one. He routinely threw together jaw-dropping performances, complete with beautiful spin moves, laser passes and chase-down blocks, against the Warriors’ armada of skilled defenders. Underline that point twice in red ink: James’s unprecedented individual playoff heroics came against a juggernaut that deserves a place in the Greatest Team of All-Time conversation. His feats would be worthy of gushing if they came against an average Finals opponent, and they deserve to be amplified given Golden State’s obscene degree of difficulty. Make no mistake, James’s regular season was great too. He averaged better than 25/5/5 for the 13th (!) straight season, he led the league in Real Plus-Minus and minutes per game, he captained the most efficient offense of his career, he averaged career-highs in rebounding and assists, and he rediscovered his confidence in his three-point shot. Along the way, he became the only person to stave off aging more effectively than Halle Berry. Nevertheless, James enters this season facing more questions and potential landmines than at any time since he won his first title in 2012. Kyrie Irving’s departure combined with Isaiah Thomas’s hip injury will place an even greater burden on his shoulders during the regular season. The rumor mill surrounding his 2018 free-agency has already been going full tilt since June. The gap between the Warriors and Cavaliers has only grown wider during the offseason. The typical production/age curve suggests that Kevin Durant, Stephen Curry, Kawhi Leonard and James Harden—all under-30 talents that fill out this list’s top-five—should expect to make up ground on the 32-year-old James. Irving’s trade request and exit adds another wrinkle to this discussion, as it represents the first time that a star has chosen to leave James’s side. For years, James’s skill has always justified whatever other baggage or distractions that his personality, fame, ego and contract situation might create. Now, suddenly, here’s a convincing piece of evidence that the scales have tipped, at least for one young, hungry All-Star. In light of Curry’s willingness to recruit Durant and Durant’s subsequent decision to take less money so that Golden State’s rotation could stay together, a new argument against James might develop. If the Warriors emphatically repeat as champs, some observers might be inclined to assert that Durant or Curry should surpass James as the sport’s best player because they’ve shown that winning at an extraordinarily high level for years on end need not be a dramatic and volatile enterprise.